Fire the guns and Roll the Tanks! Here’s the new disc from (now) L.A. based band Roll the Tanks. 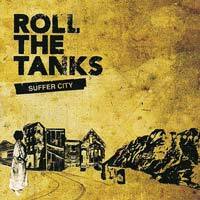 Suffer City is the sophomore effort from the band. Originally from the Boston area, the band now contends with sunshine and smog. I’m not familiar with the bands prior work, but what I’m hearing on the new disc is enjoyable so far. What you get is 11 tracks of somewhat unique sounding punkish rock somewhere between The Clash and Modest Mouse. In all honesty, I’m rushing through this, but for real I do like what I’m hearing. It (the disc) has a distinct early 80’s vibe to it. I’d even go so far as to say I’ll listen to it again.